When things get disorganized I feel really scattered and wind up dropping the ball. 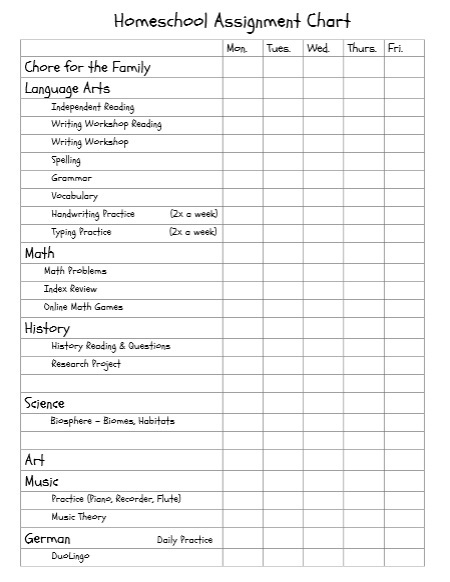 There’s a lot for homeschoolers to keep track of, right? So, how do we keep on top of everything? Being brutally honest here… I/We can’t always do it all! Homeschooling is challenging because there are so many different areas to juggle, not just the academics. We just do the very best we can! First the daily: I really try to have a “spot” for everything so we know where to find it the next day. The kids also have to learn to return their books and papers to the right place. Putting it away takes diligence and lots of friendly reminders, right? Funny enough, I also try to vacuum at least twice a week. That’s not only because we have a pets and a wood-stove (and that brings in twigs and bits of bark), but also because then we pick up the stray pencils, papers, and glue sticks that have wound up on the floor. We also use 3-ring notebooks for history and science. The kids file their papers once we’ve finished that subject for the day. That helps to keep the paper-clutter down and to find them when we need them. 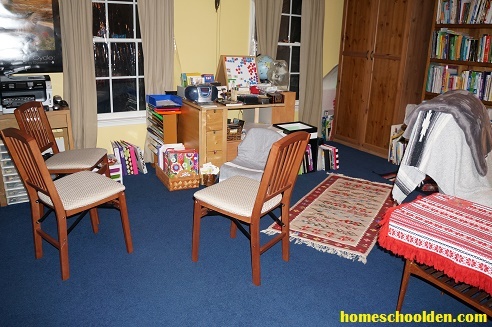 At the beginning of each semester, I usually try to dive in and spend some time re-organizing our homeschool space to make sure it is working for us. I sort, get rid of things, file things and really think about how best to use our space. Last year I had a lower back injury (as a result of all the surgeries and crazy problems I had the year before). We used to spend a lot of time sitting on the floor together, but we’ve actually started sitting together on chairs in a small circle (especially for German). We use the CD player every day and move around during our conversation time so sitting around a table really wouldn’t work. In January, I spent time making that space work a bit better for us. And, now that the kids are older, they need their own designated space to write and work. DD had gotten an art desk for Christmas a year or so ago. She loves it and uses it every day. ED really wanted one too and we managed to get it on super-sale from Michaels. Grams and Gramps gave it to her for her birthday a week or so ago and she *loves* it! 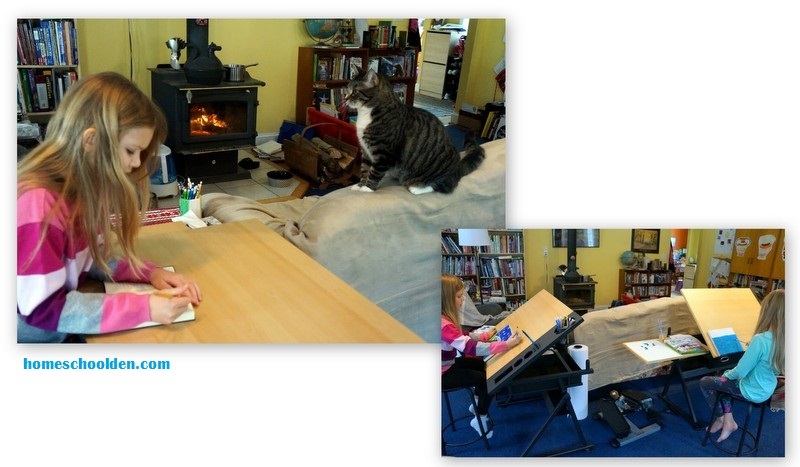 The neat thing about this art desk is that they can pull it up to use it as an artist’s easel, but mostly they have it flat and do their main subjects (math, writing, etc.) there. We use our crock-pot a lot, which helps but this can be a struggle for us in the evenings when all three kids have activities that end at 7:30 or 8:3o pm! Our current favorite go-to meals include: tortilla soup, meatloaf, Middle Eastern lentil soup, beef stroganoff, chow mein, korma chicken, burritos, minestrone soup, Hungarian goulash, baked chicken, spaghetti, and tacos. At this point in our lives, we really have to have a calendar to keep track of everything. 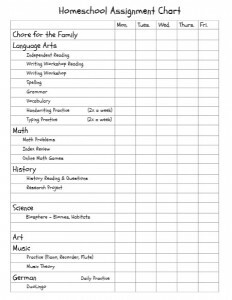 I keep everything in a 3-ring notebook and print out our calendars and checklists (you can see the latest calendar & homeschool planning pages I made here). I think we all wind up finding a system that works best for us. I like the 3-ring notebook because it has a pockets where I can stick papers that we’ll need later (birthday invitations and things like that). And, I can take it with me when I go to various meetings. What outside activities do the kids do? LD does boys gymnastics (16 hr/wk) and choir. DD does choir, flute lessons (via Skype from someone we found at takelesson.com), homeschool art class, drama, girl scouts, and running. ED does rhythmic gymnastics (12 hr/wk), homeschool art class, piano, and brownies. We also have a homeschool group we participate in once a month or so. It’s so important to stay connected with our friends and loved ones, right? And, we all have to keep on top of various doctor’s and dentists appointments. To do that, I really have to get that stuff written down on the calendar I mentioned above. 🙂 This is a short paragraph but SO important!! I generally blog 3-5 times a week… mostly M-F. 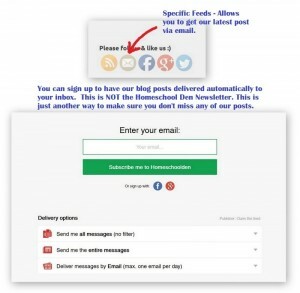 I post on our Homeschool Den Facebook Page several times a day. Most of the time, the 10am post is our latest post on the blog. At noon I share a post that is geared for the younger crowd (ages 2-6 or so). And, I post again at 3pm on FB generally with elementary/middle school posts. Sometimes I post in the evening as well – generally Tuesday or Wednesday. 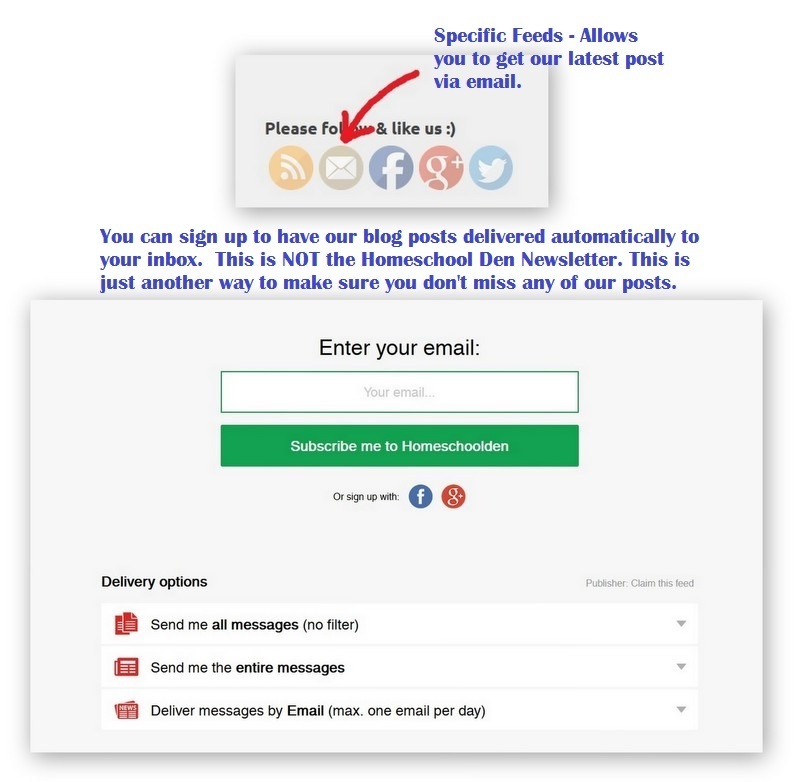 The Homeschool Den email newsletter comes out every week or two… generally on a Monday or Tuesday evening. 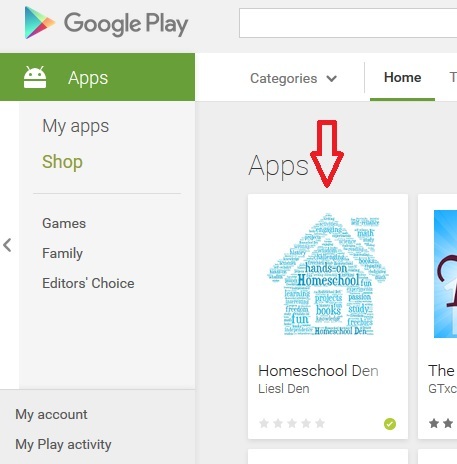 Over the holidays, Hubby had a surprise for me… he created a Homeschool Den App… It is now up and running in the Google Play App Store! How cool is that! Just another way to keep in touch with us while you’re on the go! Yay for Hubby, I would have absolutely no clue how to have done that! And, I have been working hard to try to make the blog more user friendly. 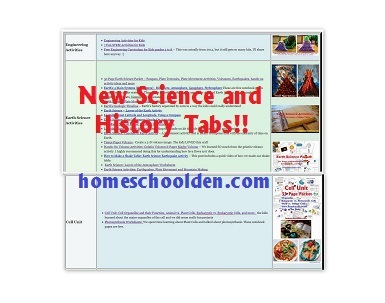 Last week I got a HISTORY TAB and a SCIENCE TAB done!! You can scroll through the posts we’ve done in various categories. Perhaps I’m not the absolute expert on organization (my cousin runs an organization business professionally which I could *never* do!! ), but we’re here, we’re healthy, we’re learning, and we’re happy! We do the very best that we can and we all work as a team (most of the time!) to keep things running smoothly. The biggest thing I try to keep in mind is that we all have to take control of our time and our priorities. Life is what we make it, right?! Happy Homeschooling and Terrific Teaching! See you again soon here or over at our Homeschool Den Facebook Page. Don’t forget to Subscribe to our Homeschool Den Newsletter and be sure check out the new (free) Homechool Den App! Next story U.S. Presidents’ Worksheets – Presidents Day and US Presidents Song!